Bobby Lawrence Karate was able to come and visit Riverview 4th graders. They taught them about the ABC's of Success! The students loved participating and learning goal setting and accomplishing. They had the opportunity to practice some karate and show off some side kick moves they learned. THANK YOU TO BOBBY LAWRENCE KARATE! Mrs. Nielson & Mrs. Callister's 2nd Grade Class have been talking about the jobs within their local community and on Patriot Day, September 11, invited Officer Hooley of the Spanish Fork Police Department to come talk about the service he provides to our community. The students got a chance to learn how he helps others in his job and how he decided as a kid, to one day grow up to be a policeman. It was a very positive experience for the students to meet a policeman, and a great way for them to honor one of our local community helpers on this special day of rememberance. 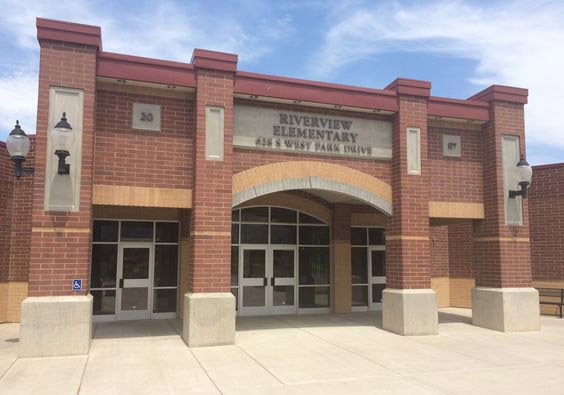 The 4th grade classes at Riverview were able to demonstrate their understanding of the scientific method by building their own project to keep their raw egg from cracking after being dropped off the roof of the school. The students enjoyed watching their eggs fall from the roof to see if they would survive. In honor of 9/11 the first grade students at Riverview participated in the changing of the schools old flag with a bright new flag. The students learned the correct procedures on handling, folding, and showing the proper respect towards the American flag. Kindergarten students graduated today! They showed off what they have learned through rhyming and songs. They sang about the alphabet, spelling, numbers, and their field trip to the zoo. Their performances were wonderful and so fun to watch. Thank you, kindergarten teachers, for all of your hard work in giving these little ones a solid and happy foundation for the rest of their school years. On Wednesday 4/24/13, six 6th Grade students from Riverview were among those representing the many "TERRIFIC KIDS" we have at Riverview and were honored by the Spanish Fork Kiwanis Club at an awards ceremony.The award recipients were: Brooklynn, Jorge , Amanda, Garrett, Racquel, Donovan, Mitchell, and Kelina. Congratulations! The program aired on Spanish Fork Cable Network, their names will be on a plaque at the school and they will be able to participate in the 24th of July Parade. Great job to all of our wonderful 6th graders at Riverview and to these six individuals and thank you to the 6th Grade teachers for how you help enrich these students! Continue to exemplify what "TERRIFIC KIDS" stands for each day. Our school's orchestra performed for us last Thursday. Mrs. Wangsgard did such a fantastic job helping these students learn their instruments and perform songs together as a group. Some of the songs that required plucking the strings really caught the ears of the students! Some of the orchestra members played familiar tunes that almost every student knew. One was the theme song from Star Wars! Students were able to see and learn about the violin, the viola, and the cello. The students sounded great! Thanks for working so hard! Mrs. Wangsgard said she wants even more 5th graders to join next year. What a great idea!